Salem, OR—In 2016, Oregon workers’ compensation costs will decrease an average 5.3 percent, the Department of Consumer and Business Services (DCBS) announced today. This marks the third year in a row – and eighth year in the past decade – that Oregon businesses are seeing an average decrease. The department approved the average decrease in “pure premium,” which is the portion of the premium employers pay insurers to cover anticipated claims costs for job-related injuries and deaths. Workers’ compensation pays injured workers for lost wages and medical care for job-related injuries. A four-year decline in average medical care costs and stable wage replacement costs are the key factors continuing to drive down the pure premium. The decrease is based on a recommendation from the Florida-based National Council on Compensation Insurance Inc. (NCCI), which analyzes industry trends and prepares rate recommendations for the majority of states. Pure premium reflects only a portion of workers’ compensation costs but is the key factor behind annual cost changes. The decrease is an average, so an individual employer may see a larger decrease, no change, or even an increase depending on the employer’s own industry, claims experience, and payroll. Also, pure premium doesn’t take into account the varying expenses and profit of insurance companies. The rate decrease is effective Jan. 1, 2016, but employers will see the changes when they renew their policies in 2016. 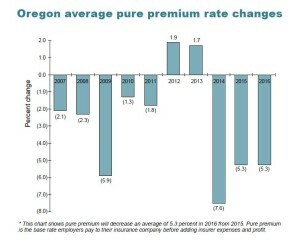 Oregon’s workers’ compensation premium rates have ranked low nationally for many years. Only seven states and the District of Columbia had average rates lower than Oregon in 2014, according to a biennial study conducted by DCBS. In contrast to changes made in some other states, Oregon has seen no meaningful reduction in worker benefits since at least the early 1990s. • An assessment on workers’ compensation premiums to fund the state costs of running workers’ compensation and safety and health programs. • An assessment on hours worked to fund Oregon’s highly successful return-to-work programs that help injured workers return to work quickly and earn close to their pre-injury wages. This assessment also provides increased benefits over time for workers who are permanently and totally disabled, and gives benefits to families of workers who die from workplace injuries or diseases.